North Korea continues to produce and stockpile cluster munitions, a weapon outlawed by most of the world, a U.S government-funded radio station reported Friday, citing an international watchdog's annual report. The nongovernmental Cluster Munition Coalition released the report at the United Nations in Geneva on Thursday, according to Radio Free Asia. Cluster munitions are fired by artillery and rockets or dropped by aircraft and open in the air to release multiple smaller bomblets or submunitions over an area the size of a football field. 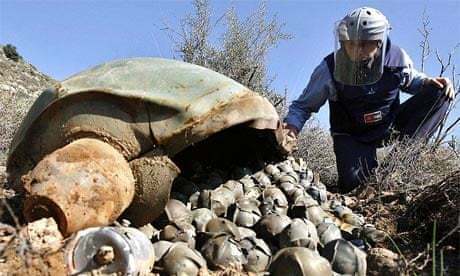 The Convention on Cluster Munitions, which went into force in 2008, bans the use, production and trade of cluster munitions and obliges states to compensate victims. Soviet-made cluster munitions flowed into at least 36 countries after the breakup of the Soviet Union, through which North Korea obtained and stockpiled them, the report said.